Kitt's World: Are You Ready For Some Football. If you saw my video yesterday, you know I lost a monkey. He wasn't hanging with Roo either. But, I did find some monkeys playing football. LOL. I'm entering this card in the CardzTV cricut banner challenge and Funday anything goes challenge. I used the Life is a Beach cartridge for the palm trees, cut at 3 and 4 inches.And the Everyday Paperdolls for the football helmet and ball. I used Create a Critter for the monkeys cut at 1.75 inches.Also used Peachy Keen Everyday faces for the monkey eyes and Cuddlebug Palms embossing folder for the tree leaves. 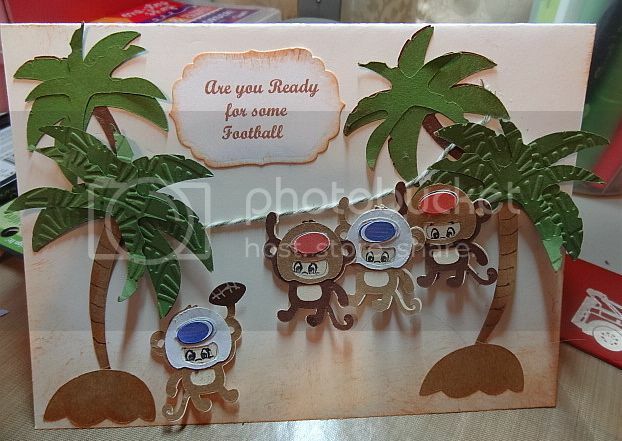 Pop dots were used for the monkeys and the larger palm trees .I edged the card, label and trees with Tim Holtz tea die ink and used a white pen for the football and a dark brown marvy marker to draw the lines on the trees. Also used the Spellbinders die label for the sentiment that was typed on the computer. Thanks for stopping by. Comments are appreciated.